had always presumed that movie sequences where reporters run for their lives, were the result of bad scriptwriting. As anyone who has spent time in a newsroom or on the field will tell you, there is a higher chance of a reporter dying from ennui than being chased down the streets of Mumbai by a bunch of goons. 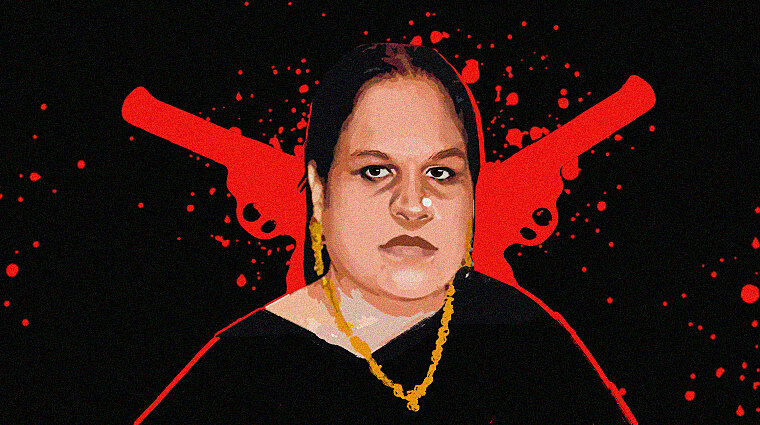 Until the day, I encountered Haseena Parkar, sister to Dawood Ibrahim, known by a single, forbidding moniker: Aapa. About 12 years ago, I started working with MiD DAY newspaper and made the transition from a city and Bollywood writer to crime reporting. During my time spent walking around Mumbai’s underbelly, I befriended Illias Shaikh*, a local bhai and a great fount of stories. It was during one of our regular late-night meetings around 2007 that I realised he knew people in the “Company”, including Haseena Parkar. I was fascinated with her. A year prior, a case of forgery and extortion had been lodged against her and seven others, adding to the godwoman aura she had acquired. And an interview with Parkar would be a total coup for a young journalist like me. In December 2006, a real-estate agent named Vinod Avlani had complained to the Crime Branch that he had given ₹1 crore to Krishnamilan alias Baba Shukla for a redevelopment project that had fallen through. Shukla was a big fish with a notorious reputation; he had cases of fraud and cheating against him. The FIR said the money was paid through a demand draft during a deal at Parkar’s Gordon Hall residence in Mumbai’s notorious Nagpada area. When the deal fell through, Avlani received only ₹70 lakh in return and alleged that Shukla had got Parkar to threaten him. Parkar soon disappeared without a trace and a non-bailable warrant was issued against her. Although later she did get bail, things grew murkier by the second because retired assistant commissioner of police, Anil Mahabole, seemed to be involved in the dirty deal. It was an exciting time for a newsroom in the early noughties. And an interview with Parkar would be a total coup for a young journalist like me. I pushed Illias bhai for a meeting with her and we agreed on an August afternoon. I met him outside Gordon Hall, along with a colleague named Shiva Devnath, who was then working with Mumbai Mitra newspaper. We’d both driven there on his Yamaha RX 100. As we crossed Agripada, I thought about the area’s long affair with the underworld. Dawood had once held court over its grimy gallis. Chhota Shakeel, Asif Baatla, Ahmed Kashmiri, and several others had once ruled here. In the early years, Agripada was known for “soda baatli” fights, where empty soft drink bottles would turn into improvised weapons between gangs; over time, the baatlis had morphed into rampuris. Now, Parkar lorded over this kingdom of organised chaos. Gordon Hall is an old eight-storeyed building, guarded by assorted muscle-bound types. Since we had Illias bhai with us, we were spared any probing questions. Parkar’s daughter answered the door and led us into a huge hall. I sorely wanted to take in as much as I could, but I also did not want to piss anyone off by looking too curious. We’d already been warned against attempting to shoot or record anything. I knew I would be talking about this interview with friends and colleagues for many years, but what twist it would take, I then had no idea. I had to play my cards right. Just that morning, MiD DAY had carried a news report against Parkar. If I were to introduce myself as a MiD DAY reporter, there was no telling how things would turn out. So I had to introduce myself as a journalist from Inquilab, MiD DAY’s Urdu publication. Within a few minutes, a plump woman in a burqa, a little over 5’2” feet walked into the hall and sat opposite us. This was the famed aapa. She would be the high point of my journalism career. I knew I would be talking about this interview with friends and colleagues for many years, but what twist it would take, I then had no idea. Straight off the bat, Parkar’s daughter announced that aapa would not be speaking. Even though she just sat there, Parkar was an overwhelming presence in the room. She waved at a woman and in a deep, heavy voice, instructed her to get us something to eat. We were offered sheer korma but my mind was racing with ideas on how to get her to talk. The trick that I had learnt on the job was that if you need to speak to an accused, you need to be on their side to convince them to talk to you. I told myself, “Yeh dabbe main uttar gayi.” Shiva and I started asking her about the case and her involvement in it. She spoke in an even voice, devoid of any emotion, and answered all our questions. She was confident that the case was a routine affair and that she would soon be out of it. I couldn’t believe my luck. While leaving she happened to uncover her face: I can never forget her deep-set eyes. I wanted to ask her a question about Dawood, but was scared. I gathered courage and asked her if she thought she was targeted for being the sister of one of India’s most-wanted men. She did not answer and I realised I should not prod her about Dawood. In that moment, by not uttering a word, aapa had shown me my place. After about 30 minutes, the interview was over. As the evening stole upon Agripada, we thanked her for the sheer korma and for the interview. While leaving she happened to uncover her face: I can never forget her deep-set eyes. Veteran crime journalists had been struggling to get a quote from the inaccessible aapa for years, and here I was sitting face-to-face with her. I instinctively wanted to take a picture, but I knew better. Here’s when things got interesting. By this time, Shiva and I were heaving with fear. Shiva advised me to leave the bike and just run, but I knew that would be the end of us. I told him to push the bike, thinking I’d pick it in the second gear. Miraculously, that ruse worked and we sped for our lives. I did not stop until I crossed the Nagpada signal and found the ATS headquarters to my left. We rushed inside, hoping for some respite from this fearsome drama. We stayed there for an hour, shivering with fear. Once we gathered ourselves, I called up my boss and reached my office at Parel to file the interview, which would become the page one story the following day. Shiva left for his house and we decided to keep mum about the incident. We had no idea if Mahabole or Parkar’s henchmen would be lurking around, waiting for us in the shadows. I did not call Illias bhai either, as I was afraid. A few days later, I connected with him and we met at his house as we used to meet regularly. Since then we have never discussed the incident with each other. I haven’t spoken about my encounter with Haseena Parkar to anybody in the family, though our misadventure has become somewhat of a legend among crime journalists. I watched the trailer of Haseena Parkar and laughed to myself. Shradhha Kapoor would never be able to pull off the menacing aapa. Today when I read reports about a “scared” Dawood Ibrahim hiding in Pakistan, my mind goes back to the woman who stayed on in Mumbai even as others fled. If there’s a personification of sheer terror, for me, it will always be Haseena Parkar. Ketan Ranga is a former investigative journalist. He has worked at MiD DAY and Mumbai Mirror.